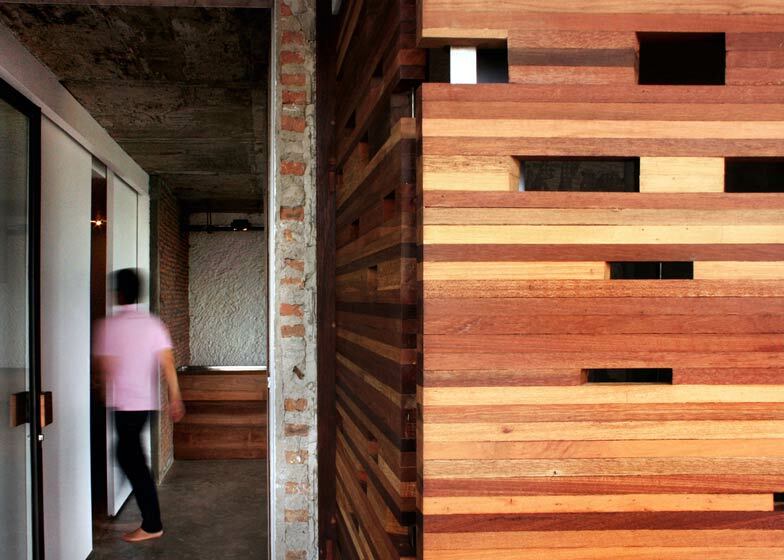 Thai architects Architectkidd built an outdoor shower room behind wooden screens on the balcony of this renovated apartment in Bangkok (+ slideshow). The perforated screens around the shower were made by a local carpenter who used material scavenged from demolished buildings. 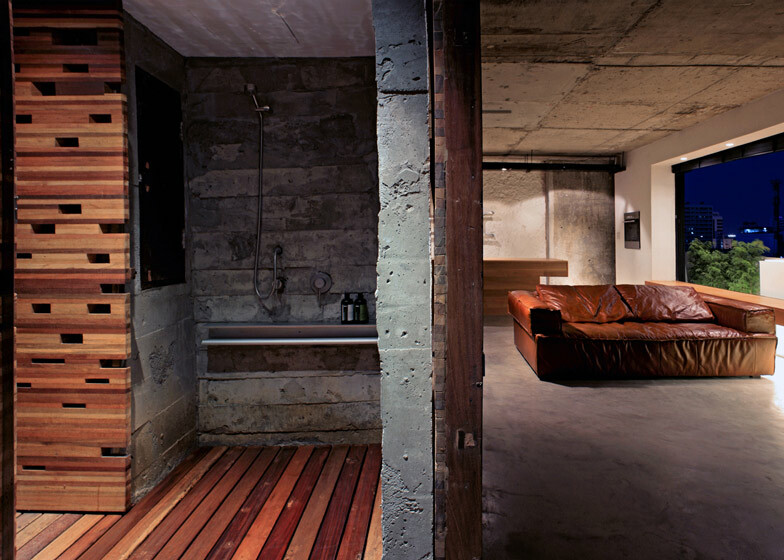 Exposed concrete lines the rear walls of the shower room, as well as walls, floors and ceilings elsewhere in the apartment. 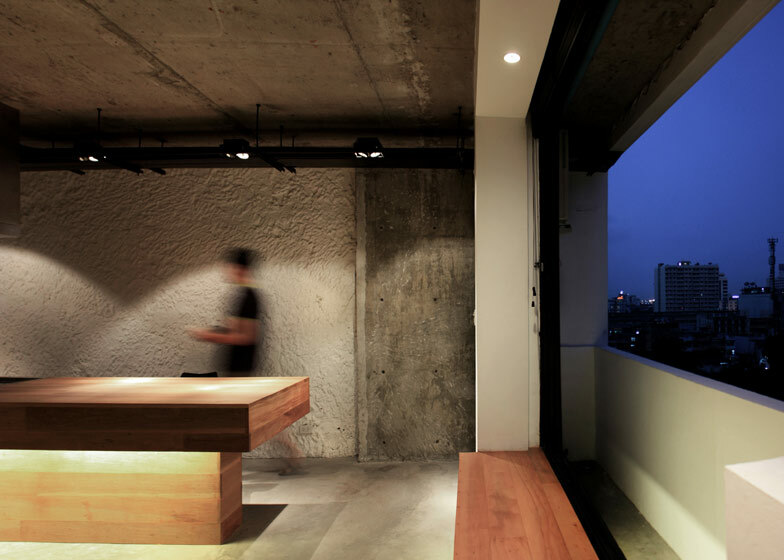 Rooms are laid out to maximise ventilation from windows on the east and south sides, which offer views out over the Bangkok skyline. The chunky wood of the kitchen counter is echoed by a solid wood bench beneath one of the windows. Another project by Architectkidd on Dezeen features a white aluminium facade with circular perforations. Photographs are by Luke Yeung and Sirisak Pituck. 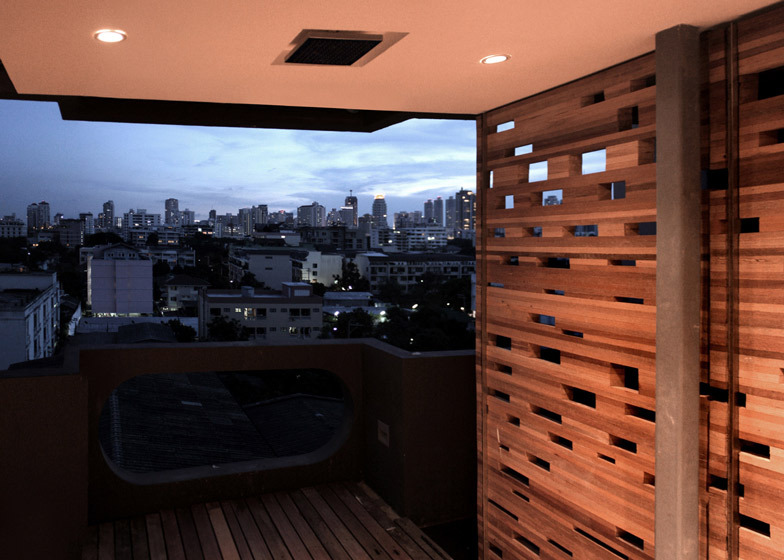 An outdoor shower is combined with a balcony and living room in this renovation of an old high-rise building in Bangkok. The design makes use of as many existing attributes and found conditions as possible. The building's location, while in the middle of the city, is away from main roads and adjacent to one of Bangkok's largest waterways, or 'klongs'. The apartment itself is located at one corner of the high-rise. In Bangkok, prevailing winds originate from the south-west direction, and as a result, the layout was arranged to maximise openings to the east and south sides to allow for cross ventilation. 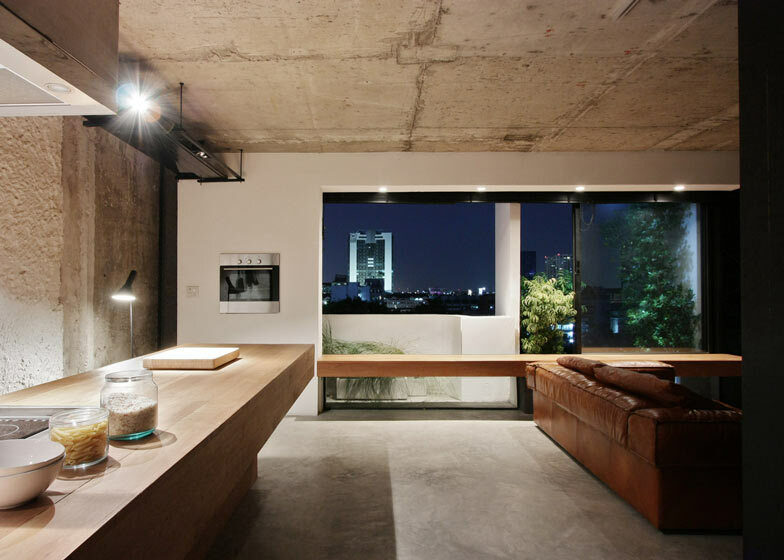 As a result, upon entering the apartment, one faces an uninterrupted view of the Bangkok skyline. 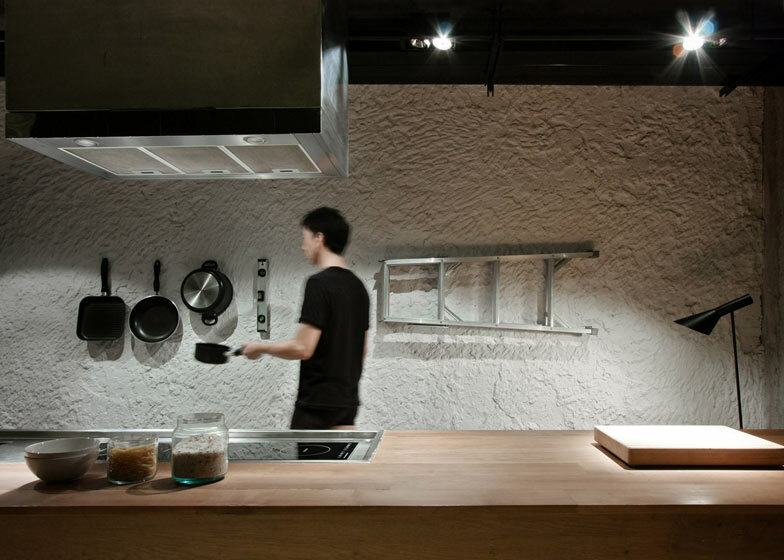 Materials and finishes were selected as spare and contemporary interpretations of Thai living. In particular, inspiration was found during visits to local workshops of craftmen and carpenters. These workshops usually consist of not only their 'working' areas, but also combined eating and sleeping areas within a limited space. 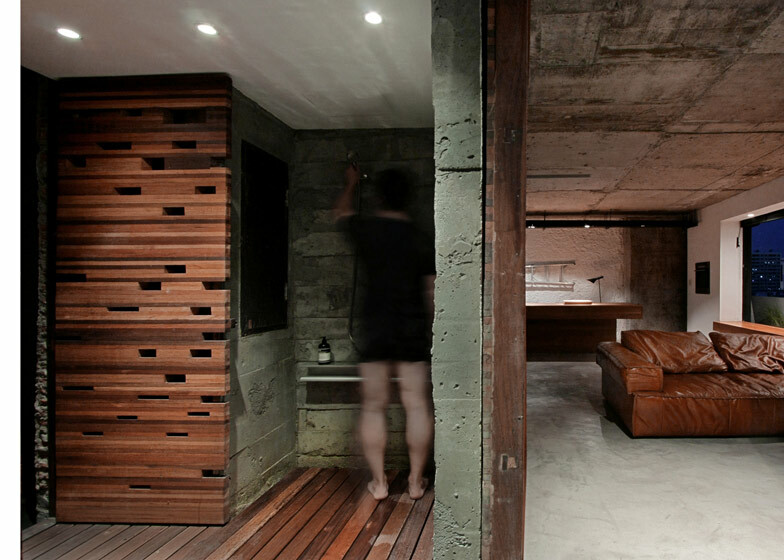 The idea of combining several functions within a compact space resulted in the design of the outdoor shower area. Working closely with a local carpenter who used wood scavenged from demolished buildings and structures, perforated wooden screens were designed using reclaimed hard wood timber. 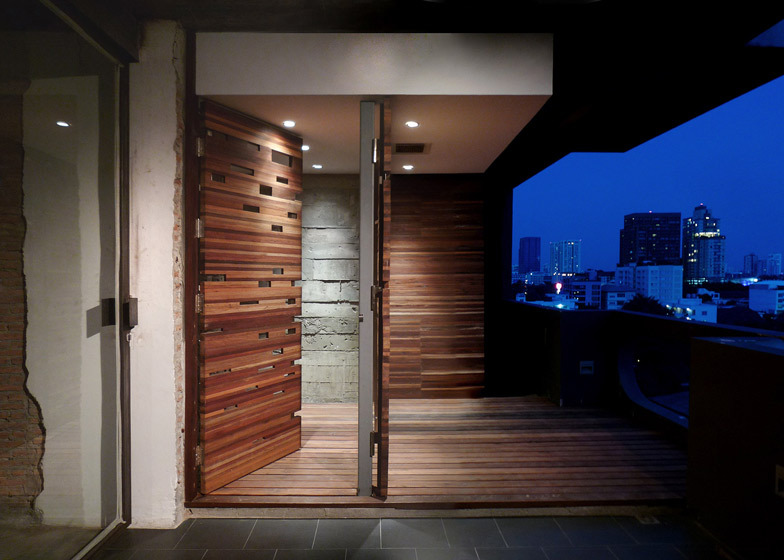 When not used as a shower, these wooden screens can be closed to enlarge the outdoor balcony space.